We heard you liked Tesla and Atari, so we smushed them together to give you this TeslAtari gameplay video. Tesla is bringing more new arcade games to its cars, adding 2048 and Atari's Super Breakout to the long, growing list of games that both drivers and passengers can play via the car's dashboard. 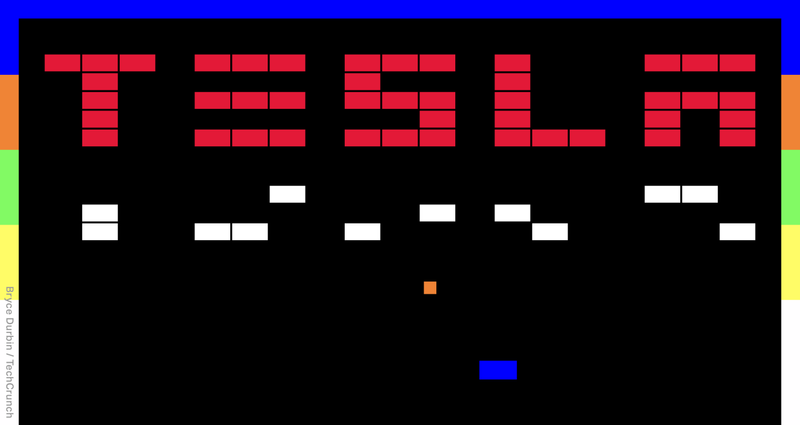 Last August, Tesla added a bunch of Atari titles to its cars via software update, which included Asteroids, Lunar Lander, Centipede, and Missile Command. The new update that brings a slew of additional titles will be available for Tesla owners soon, and some users could see the updates now, but it might take a bit for all cars to receive the update. It's an interesting time to add the games, especially as Tesla has been in the news recently for heated battles with the U.S. Securities and Exchange Commission over tweets that got Elon Musk in hot water. But Musk has always been about celebrating with fun things and memes over taking life seriously, so the fact that these new games are now included in Tesla vehicles at this time doesn't really come as a surprise. He's also tweeted this meme of Kero from Card Captor Sakura. Tesla's dashboard is capable of plenty of fun things, in fact, as the touch screen also lets you use it as a dash cam to record everything you see facing forward while driving. If you plug in a flash drive with at least 1.8 GB of space, you can save up to 10 minutes of a trip. Cars that have the full Autopilot hardware can use all their cameras for a 360-degree view around the car as well. There's even a "Romance Mode" that heats things up, and, well, a selection of farts, too. If you're a Tesla owner, be sure to report how these arcade games play on your dashboard. The rest of us lowly peons who can't afford the niceties in life will have to live vicariously through our Model S and Model X-owning overlords. Please throw us a bone. It is cold outside.